Finished or closed corner frames are the ultimate in quality and craftmanship and are not comparable with cut and joined length mouldings that are available in most frame shops. Closed corner frames are the first choice of museums and galleries. Those frames are completed after their basic lengths are assembled and joined together. The completion involves applying further and more intricate craftsmanship and artistry than just putting 4 prefabricated moldings together around artwork. The finished corner frames have greater potential of quality and value. Once joined, closed corner frames are then finished in a variety of ways from carving, application of cast compo, gesso, gilding, staining, and painting. The options to create a one of a kind frame are endless. By April Hann Lanford, Provenance, Inc.
Rust and oxidation stained industrial ingredients of our world have a seductive beauty. Leached onto the surfaces of concrete or stone of our dwellings, they speak about the presence of concealed steel frames that provide the structure to our homes. This hidden provenance becomes evident wherever we move. Why not bring this structure to the forefront, and make it a distinct statement? Not all frames are created equal. Join Bernacki & Associates for an investigation of the extraordinary craftsmanship and specialized techniques of hand carved and gilded frames. Learn the precious artistic merit of frames themselves and their crucial complementary relationship to artwork. Using antique frame examples, enjoy a live demonstration of the gilding craft and process and learn how to identify authentic gold leaf versus metal leaf, and other applications used for a variety of finishes. 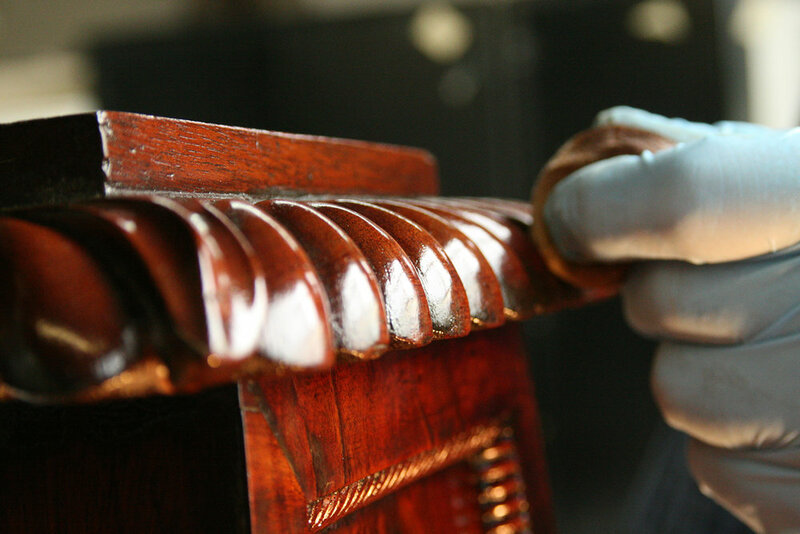 Learn how to properly care and maintain your own precious frames to ensure that they can be appreciated well into the future. Bernacki & Associates Inc. is one of Chicago’s most respected conservation and restoration firms specializing in period and contemporary fine furniture, objects, historic millwork and architectural elements. Established 30 years ago, Bernacki & Associates has become renowned both locally and nationwide as a comprehensive conservation and restoration resource. Clients include museums, antique and art dealers, private collectors, designers, insurance claims specialists, and discerning art-owners. Bernacki & Associates, Inc. is a founding member of Conservation & Design International and active part of DPR Art Rescue a 24-hour nationwide emergency service for artwork, sculpture, works on paper, murals, objects, gilt objects and frames, antique and fine furniture. For more information contact April Hann Lanford at april@dprartrescue.com, (312) 243-5669. A detail of an ornate gilded frame where the wood substrate has been severely damaged by powderpost beetles, resulting in large voids, and weakness in the wood support. What do antique frames, ethnographic items, and furniture all have in common? They are made of wood and can become good places for shelter and food sources for insects. The most common culprit for wood infestation is the powderpost beetle. Search atop and beneath wooden objects for “frass” – a powdery substance left by burrowing pests. Powderpost beetles bore in wood to lay eggs and - when they hatch – the grubs develop to pupae and then when mature the beetles bore out, leaving exit holes, a crisp hole with a delicate layer of frass along the perimeter. We are passionate about the care and display of art, photographs, works on paper, textiles, and sculpture. Framing and display options are designed to ensure the longevity of the pieces we frame through the use of archival mats, mounts, reversible mounting methods including handmade wheat paste and Asian tissue hinges. Also offered are a variety of UV filtering glazing and housing options to protect from environmental and exposure as well as fading. Our experienced artisans combine the best in old-world craftsmanship with modern techniques to create museum quality framing and displays that not only protect, but are also designed to complement the work for display. While designing framing and presentation options, we reference the piece’s historical context, and work with our clients’ vision to create frames that are works of art in their own right. An archival frame is built to last for generations, collaborate with our designers for that special piece; and create a lasting legacy. CHICAGO – The City of Chicago is home to many specialty businesses, but few businesses are as specialized as Bernacki & Associates, Inc. 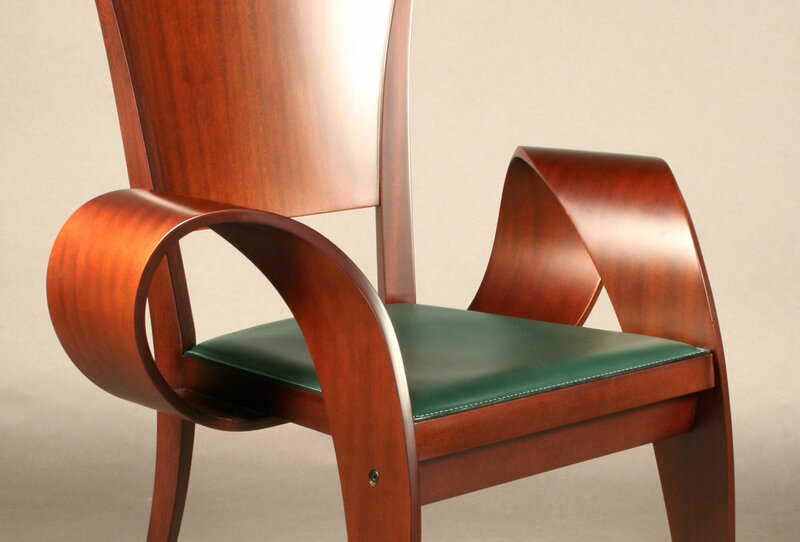 Founded by owner Stan Bernacki on July 4, 1988, the company’s focus is squarely centered upon the restoration and conservation offine antique furniture, upholstery, artwork, clocks, artifacts, sculpture, frames, family heirlooms, and historic millwork. Bernacki and his team of specialists also design and build custom furniture and interiors. His variety of clients include museums, antique and art dealers, interior designers, architects, insurance claims specialists and private collectors. From its humble beginnings in a garage near the corners of Ogden and Grand Avenues, Bernacki & Associates quickly flourished and just four years later relocated operations to a larger and more modern facility at 424 North Oakley Boulevard in Chicago. Over 20,000 square feet of modern space comfortably accommodates ample workspace for his skilled artisans, conservators, gilders, upholsterers, framers, and wood carvers. There are times when antiques require the attention of conservators. An interior designer or architect are often asked for a resource of whom they would feel best qualified for a particular piece. The striking set of antique klismos chairs were part of a collection belonging to a client of Denise Antonucci, ASID, of ASI Interiors. She contacted Bernacki & Associates to care for the chairs. The chairs were not only beautiful to look at, but were also regularly used in her client’s home. Mother-of-pearl is a beautiful naturally forming material that has been used as a decorative inlay for centuries. More properly known as nacre, it is a calcium and protein composite substance that is only produced by certain mollusks as an inner shell layer and is the outer layer of pearls. It is very strong and resilient due to its structure which consists of overlapping sheets of brittle aragonite separated by more elastic biopolymers. The thickness of the aragonite leads to the beautiful iridescence and structural colors that seem to change and flow as your viewing angle shifts. It has been used in the design of jewelry, decorative objects such as furniture and musical instruments, and architecture. In furniture, mother-of-pearl has mostly been applied in graceful, distinctive inlays to contrast with surrounding wood or other surrounding surfaces or as a complete overlay to add beauty to a less distinctive substrate. Thursday, April 26, 6:30 - 8 p.m. Example of dust accumulation on the surface. There is localized wear and abrasion along the lip of the frame from previous cleaning. We often see artwork come to our studio for treatment that has damage from improper cleaning attempts. While a caretaker has the best of intentions, sometimes their cleaning can do more harm than good. It should be noted that one should not be afraid to allow a little dust to accumulate on a piece. Even the most gentle cleaning processes involve some friction, which can lead to eventual abrasion of the surface. Sometimes, it is more prudent to have a little dust accumulation rather than inadvertently risk the cumulative effects of regular cleaning or potentially damaging the surface through improper care. If it is determined that the piece warrants cleaning, you must first confirm the item is stable enough to be cleaned. The surface should be assessed for evidence of instability such as paint craquelure, delamination of decorative films, etc. If there are any signs of instability or damage, the condition should be documented prior to stabilization and commencement of any further treatment. Check out the recent Forbes article featuring DPR’s disaster response services nationwide. By Barton Bjorneberg, Conservator, Bernacki & Associates, Inc. ...This article is going to center on the question of conservation of musical instruments, specifically harps. The primary purpose of creating a musical instrument is to fabricate a tool that will be used to make the art of music. The initial importance and quality of the instrument is primarily determined by the quality of the sounds it can create and the ease with which it can make those sounds. Instruments are made of differing types and qualities of materials and craftsmanship. The quality of the sound does not necessarily have anything to do with the quality of manufacture or the beauty of its visual appearance. Anyone who has been involved in the creating of musical instruments has had the experience of a beautifully crafted and exquisitely detailed instrument that always sounds dead and lifeless. This is often contrasted by an instrument whose finish turned out horribly, the joinery does not match accurately, and the figuring of the wood is dull, but when put in the hands of a true musician comes alive and makes sounds that are so beautiful, they make people cry. The highly decorative Portable Irish Harp, with delicate strands of gilt shamrocks and ornate swirling acanthus on a colored ground, is collected as an art object and examples are displayed in museums worldwide - but what does it sound like? Produced in the early 1800s by Ireland’s leading harp maker John Egan (fl.1803-1829), the harps were touted in newspaper adverts as having ‘great brilliancy’ and ‘sweetness of tone’. The instruments gained widespread notoriety for their splendid appearance and sound, and Egan harps graced the music rooms of the great houses of Ireland and were also played by members of the Royal Family in England. In 1821 John Egan was bestowed the prestigious Royal Warrant by the King along with the title of ‘Harp Maker to George IV and the Royal Family’, and the Royal Crest is etched on the brass plates of harps produced after this date. A century later, several harp makers imitated Egan’s Irish harp model, and it became the prototype for today’s popular Celtic harp. By the early 1900s, most extant Egan Irish harps were no longer playable, but were sold and collected as rare artifacts. As antiques, Egan Portable Irish Harps are valued for their attractive sculptural qualities, handsome neo-classical decoration and Irish symbolism, and examples are preserved in several major museum collections around the world: Metropolitan (New York), MFA (Boston), National Museum of Ireland (Dublin), V&A and Horniman (London), Musikmuseet (Sweden), as well as significant instrument collections in France, Italy and Belgium and also Japan. Typically Egan harps in museums are cosmetically strung, having the appearance of being playable, but in fact the strings are kept slack. Although wood gives the instrument its characteristic sound, the constant stress of string tension on wood over time tends to pull up the thin soundboard, and the neck twists, bringing the harp’s playing days to an end. Real horror stories are known in which fragile antique harps simply collapsed as the strings were brought up to tension. Still, with modern techniques of historical restoration, it is now possible for a few Egan harps to be made playable again.